Greg Bear was born in San Diego, California, in 1951. With a father in the navy, Greg Bear had travelled to Japan, the Philippines, Alaska and all over the US by the age of 12. At 15, he sold his first story to Famous Science Fiction and in 1979 he sold his first novel, Hegira, to Dell. His awards include Nebulas for his stories "Hardfought," "Blood Music" and "Tangents" and one for his novel, Moving Mars (1993), plus Hugos for his stories "Blood Music" and "Tangents." As an illustrator, Bear's artwork has appeared in magazines such as Galaxy and Fantasy & Science Fiction along with a number of hardcover and paperback books. He was a founding member of ASFA, the Association of Science Fiction Artists. He did the cover for his own novel, Psychlone, from Tor. Heavily involved with SFWA, Greg Bear co-edited the SFWA FORUM, chaired the SFWA Grievance Committee, served as VP for a year, and President for 2 years. Vergil Ulam is a brilliant, unkempt, maverick scientist. This SF archetype has been carrying out private research behind the back of the biotech firm he works for. When the company find out, he is fired and ordered to destroy his work. Believing his work is too important to be sacrificed Ulam smuggles it out of his lab the only way he can; in his bloodstream. What he has injected himself with is a solution containing cellular organisms, noocytes, as intelligent as rhesus monkeys. These noocytes continue to evolve within him, getting smarter, learning about his body. Ulam finds that his eyesight, posture and skin improve. However, the changes become more and more radical until the noocytes eventually cross the blood-brain barrier. Too late, colleagues realise what has happened. They also discover that he is highly infectious. Soon the whole of North America is infected and the rest of the world is in a state of panic. This exhilarating section (originally a Nebula and Hugo award-winning novella) unravels breathtakingly. We are then introduced to survivors of this thinking plague, individuals who are seemingly immune. With the switch in focus away from Ulam and the introduction of new characters, the story inevitably slows. It also cannot help but take on the language and appearance of the post-apocalypse novel. 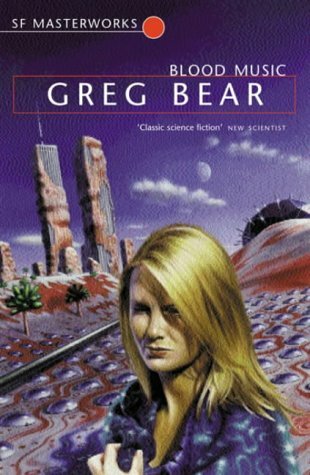 Greg Bear is in fine company here, his deserted, familiar/alien landscape is reminiscent of J.G. Ballard's disaster novels, but it lacks the energy and invention of the opening. However, the introduction of some speculation about the nature of consciousness and its effect on the physical universe soon shifts the novel back up a gear. For a novel that moves so quickly you might expect some fudge for the sake of plot but the ideas that are presented are fully explored and the characters are all well drawn. The only real flaw is a story thread that brings itself to an ambiguous conclusion before the rest of book, leaving the reader somewhat unsatisfied. Otherwise the various different strands are pulled together well for a strong conclusion. 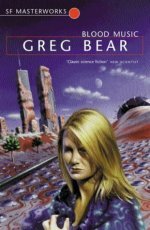 Bear also succeeds in pulling off probably the hardest task in SF, depicting a believable strongly superhuman AI. As can be expected, Bear explicitly references both Frankenstein and Prometheus. However, although the novel charts the demise of humanity, Blood Music is optimistic in tone. Despite the prejudices of the masses Frankenstein's monster is triumphant. The noocytes, cultured in Ulam's body, are genuinely better than humans and happy to invite them to share this new future. It is nothing to scared of, as one character says: "were you ever afraid of not being a baby?" Blood Music is the most recent of the Orion SF Masterworks series and can be accurately described as a modern classic. Contemporary science fiction's richest set of ideas are those that can be grouped under the bracket of trans-humanism. This includes ideas such as genetic engineering, nanotechnology and the translation of consciousness. Writing at the same time as the cyberpunk authors, Greg Bear was amongst the first to explore these ideas. To this day, it remains the defining novel of "wet" nanotechnology. Martin Lewis lives in South London; he is originally from Bradford, UK. He writes book reviews for The Telegraph And Argus.